David Cameron has challenged Gordon Brown to call an immediate general election and "let the people decide". In a rallying end-of-conference speech, the Tory leader said the Conservatives were ready for a snap poll, adding: "We will fight, and Britain will win." He said he wanted his party to inspire people with a message of optimism and hope for Britain in the "new world". Speaking without notes, he contrasted the "modern" Tories with Labour's "cynical... old politics". He reminded party members he had last addressed them in Blackpool when he had made his pitch to be their leader in 2005 - a speech which famously propelled him from outsider to favourite for the job. "Today I want to make a speech about why I want to lead our country," he said. "I'm afraid it's going to be a bit longer and I haven't got an autocue. I haven't got a script. I have just got a few notes. It might be a bit messy, but it will be me." The Conservatives have used their week in Blackpool to set out the policies they believe can win them the next election - including lifting the ceiling on inheritance tax from £300,000 to £1m and cutting stamp duty for first-time buyers. With the party trailing in the opinion polls, Mr Cameron was hoping to convince voters the Tories have what it takes to deliver changes in health, education, law and order and security. Unlike Mr Brown, who did not mention him at all in his Labour conference speech last week, the Conservative leader devoted a chunk of his address to the Labour leader. He said: "Boy, has this guy got a plan. It's to appeal to those 4% of people in the marginal seats with a dog-whistle about immigration here, about crime there, wrap yourself up in the flag and maybe you convince people you are on their side. "But I say, 'God, we have got to do better than that'. What about the 40% of our fellow citizens who have just given up on politics? "We have got to inspire them. People want the politics of belief and that means politics they can really believe in." Mr Cameron said the party would not be lurching to the right or the left. "We are going to provide the good solid leadership this country needs. "We need change for the long term, hope for our country and optimism for the next generation. That's what this week has been about and that's what I am about." Mr Cameron said Mr Brown's "worst legacy" had been "his destruction of Britain's pension system and we in this party will never let him forget it". In government, the Tories would create a "lifeboat fund" to give 125,000 people the support they deserve "after being let down so badly by this government". His party would end the "revolving door" of the benefits system and seek the involvement of charities, voluntary bodies and private companies to help run it. "We will say to people that if you are offered a job and it's a fair job and it's one that you can do and you refuse it, you shouldn't get any welfare," he said. Describing the Tories as being "the party of the family", he said they would end the "couple penalty" on benefits, recognise marriage in the tax system and give time and flexible working to employees with children. 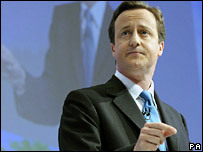 On health, Mr Cameron said his party would "scrap top down targets and trust our professionals in the NHS". It would get rid of paperwork and targets and concentrate on "beat-based zero-tolerance policing". Mr Cameron hit out at the government's treatment of the armed forces, accusing ministers of having "broken" its covenant with military personnel. And in a dig at Mr Brown's repeated references to his upbringing as the son of a manse, the Eton-educated Tory leader said he could not "give you some hard luck story" about his background. He said his mother, a magistrate, had instilled in him the belief in public service, and it was now time to introduce "national citizen service" to teach young people about self respect and responsibility. He said despite the internet age the political system was still "stuck in the dark ages" with voters having "to take what we are given and put up with it". A prime example was the refusal by Mr Brown to accept demands for a referendum on the European Union treaty, which Mr Cameron said was "one of the most blatant breaches of trust in modern politics". For Labour, Cabinet Office Minister Ed Miliband said the Tory leader had "tried to give the appearance that the Conservative Party has changed - the truth is this is the same old Tory Party making billions of pounds of tax and spending commitments they cannot pay for".